The prognosis of periapical surgery has been improved in recent years with the use of new instruments and materials. Mineral trioxide aggregate (MTA) is considered the cement of choice for periapical surgery; however, a new calcium silicate-based material seems to improve on some of the properties of MTA. Two patients were referred to the oral surgery department of the University of Valencia, Valencia, Spain, for periapical surgery of 2 maxillary teeth. Clinical examination revealed pain in both cases. Periapical radiography and CBCT confirmed the diagnosis. 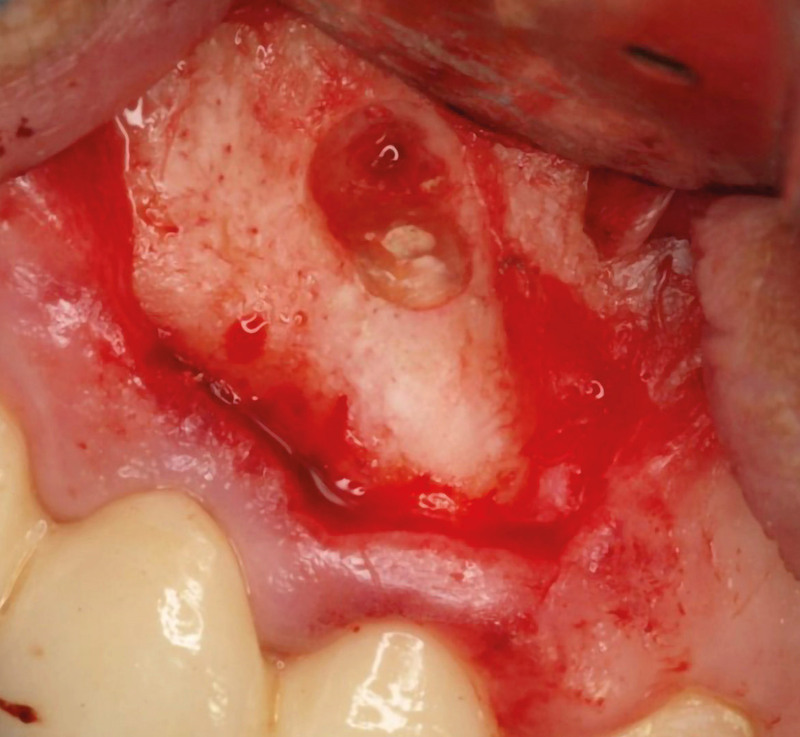 The same surgical protocol was employed using a tricalcium silicate cement as a retrograde filling material. Up to 1-year clinical and radiographic control showed complete healing of soft and hard tissue. 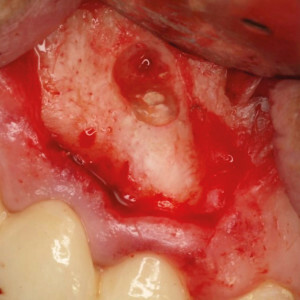 The success of periapical surgery achieved in both cases and the adequate management of tricalcium silicate cement as a retrograde filling material are highly promising. Endodontic surgery; periradicular surgery; Biodentine; retrograde filling. Recent meta-analyses1Setzer FC, Kohli MR, Shah SB, Karabucak B, Kim S. Outcome of endodontic surgery: a meta-analysis of the literature—Part 2: comparison of endodontic microsurgical techniques with and without the use of higher magnification. → J Endod. 2012 Jan;38(1):1–10.,2Tsesis I, Rosen E, Taschieri S, Telishevsky Strauss Y, Ceresoli V, Del Fabbro M. Outcomes of surgical endodontic treatment performed by a modern technique: an updated meta-analysis of the literature. → J Endod. 2013 Mar;39(3):332–9.,3Von Arx T, Peñarrocha M, Jensen S. Prognostic factors in apical surgery with root-end filling: a metaanalysis. → J Endod. 2010 Jun;36(6):957–73. However, the very long setting time, high cost and difficult manipulation of MTA prevent clinicians using it for many cases. In 2009, a new material containing tricalcium silicate, calcium carbonate, zirconium oxide and calcium chloride, specifically designed as a dentin replacement and named Biodentine, was formulated by Septodont. Recent studies on the material’s properties concluded that tricalcium silicate cement can be used in similar applications to MTA.4Laurent P, Camps J, De Méo M, Déjou J, About I. Induction of specific cell responses to a Ca3SiO5-based posterior restorative material. → Dent Mater. 2008 Nov;24(11):1486–94. The main advantages of this cement over MTA are a quicker setting time, better consistency and improved handling (product packaging in a capsule allows the practitioner to achieve a reproducible material with optimal properties every time).5Caron G, Azérad J, Faure MO, Machtou P, Boucher Y. Use of a new retrograde filling material (Biodentine) for endodontic surgery: two case reports. → Int J Oral Sci. 2014 Dec;6(4):250–3.,6Bachoo IK, Seymour D, Brunton P. Clinical case reports using a novel calcium-based cement. → Br Dent J. 2013 Jan;214(2):61–4. 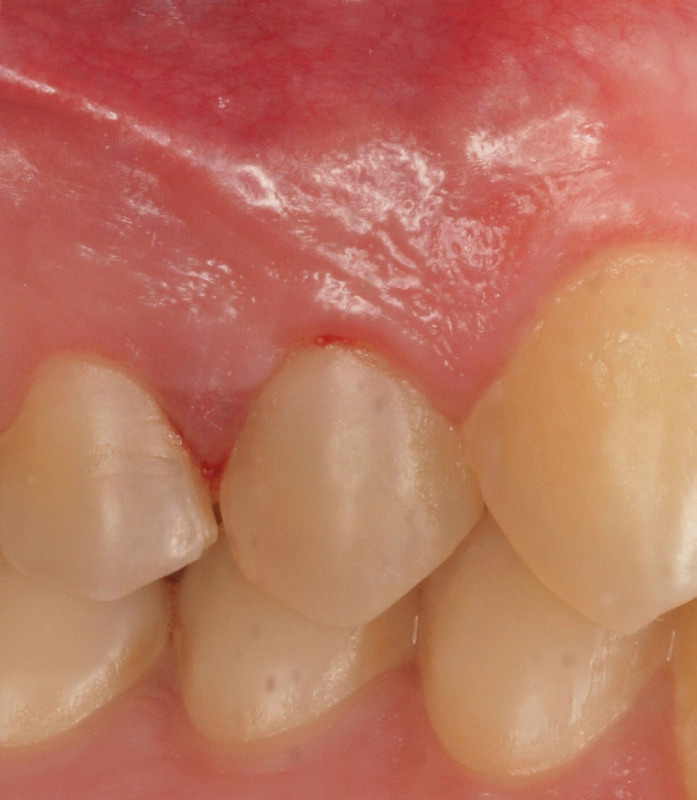 The use of tricalcium silicate cement as a retrograde filling in periapical surgery is little documented. 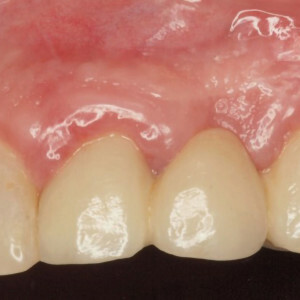 The aim of the following case reports is to describe its use as a retrograde filling material. A 36-year-old male patient was referred to the oral surgery department of the University of Valencia, Valencia, Spain, for possible periapical surgery of the maxillary right first premolar because of a persistent apical lesion after 6 months of endodontic retreatment. In the review of his medical history, the patient did not mention any kind of health problem and reported no history of allergies nor use of any medication. Clinical examination (Fig. 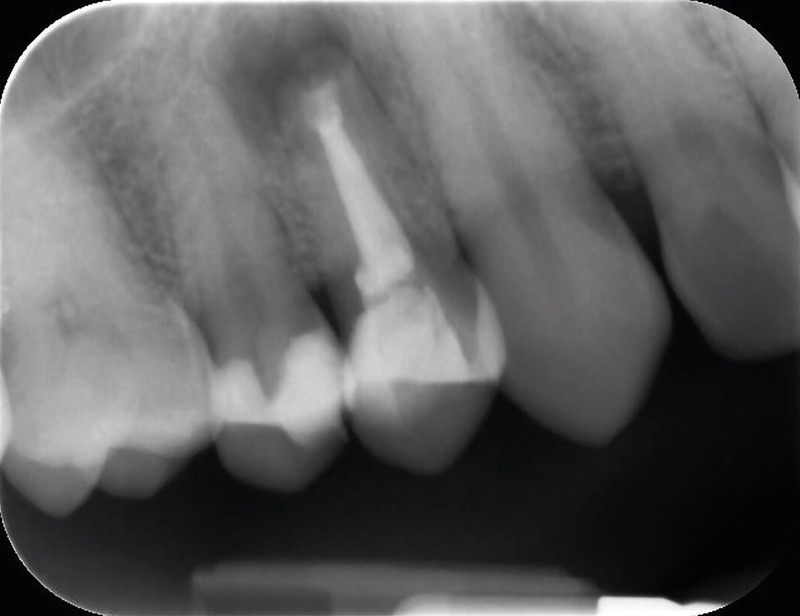 1a) elicited pain, and the periapical radiograph showed a radiolucent area surrounding the tooth apex (Fig. 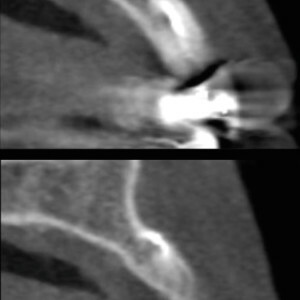 1b), confirmed by a CBCT scan (Fig. 1c). Probing depths were normal at the vestibular and lingual aspects. The surgery was carried out under local anesthesia with 4% articaine and 1:100,000 epinephrine (Inibsa). 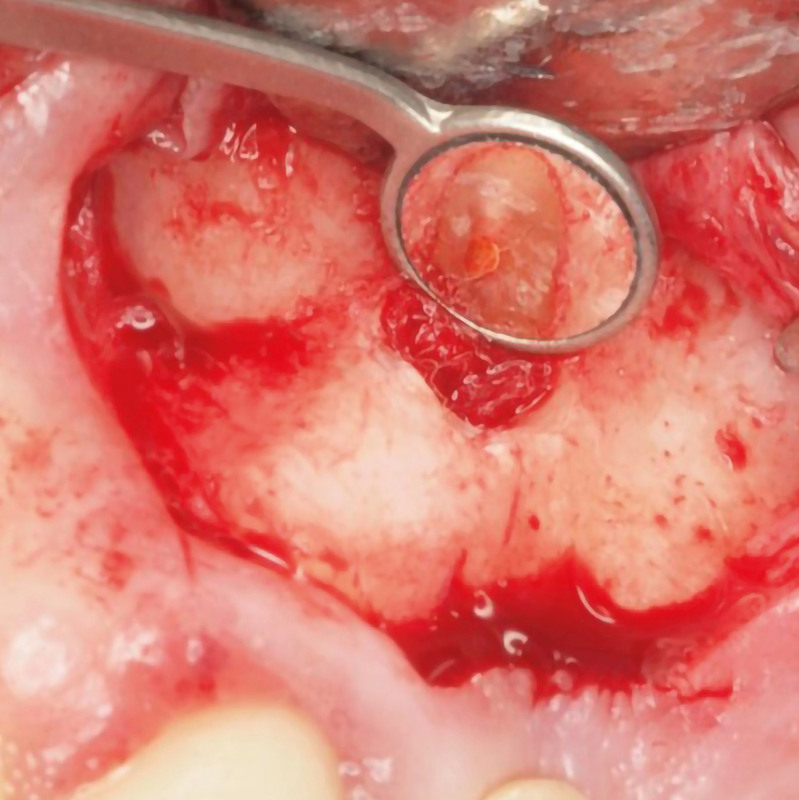 After elevation of a full-thickness mucoperiosteal flap, ostectomy was carried out using round 0.27 mm tungsten carbide burs (JOTA) mounted in a handpiece and abundant irrigation with sterile physiological serum, and debridement of the pathological tissue around the apex was performed. The root of the premolar was then resected approximately 3 mm from the apex (Figs. 1d & e). Hemostasis of the bony crypt was achieved with epinephrine (1 mg/mL; B. Braun). Root end cavities were prepared with sonic-driven microtips (Piezomed, W&H Dentalwerk Bürmoos) and were retrofilled with Biodentine (Fig. 1f). 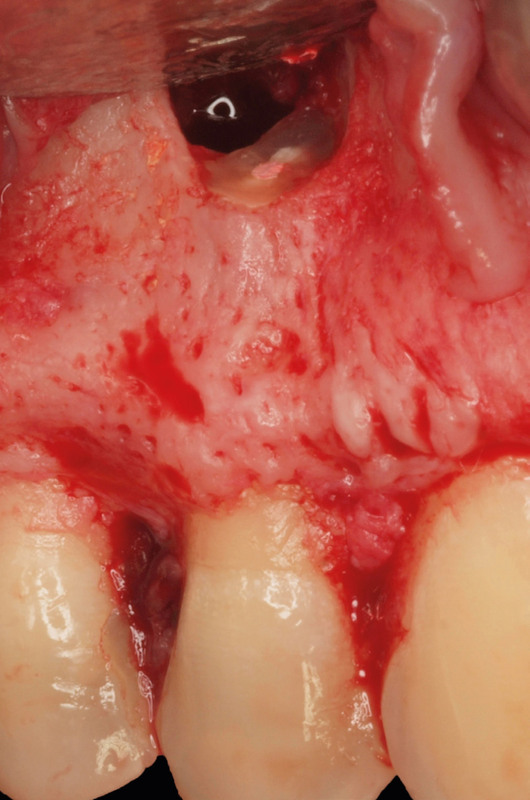 After cleaning of the wound area, a hemostatic sponge was introduced into the bony crypt (Gelatamp, ROEKO) to avoid softtissue collapse, and primary wound closure was accomplished with multiple interrupted sutures using a 4/0 thread (POLISOFT, Sweden & Martina). 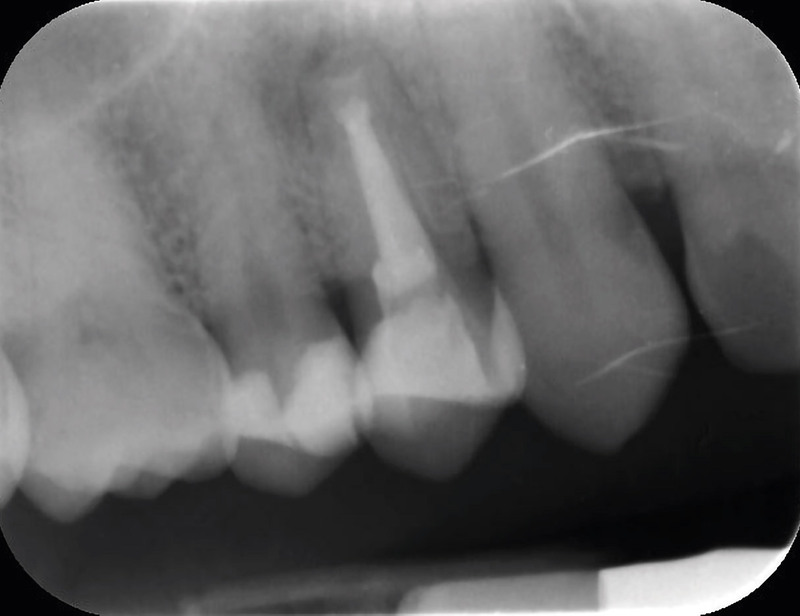 The postoperative periapical radiograph showed adequate retrograde filling (Fig. 1g). The following medication was prescribed: amoxicillin (500 mg/8 h) preoperatively (2 days before surgery) and 5 days after the intervention, ibuprofen (400 mg/8 h) for 4 days, a 0.12% chlorhexidine rinse 3 times a day for 7 days, and paracetamol (500 mg) as needed. The sutures were removed after 1 week. At the follow-up visit after 1 year, the teeth were asymptomatic, no gingival recession had occurred and normal periodontal probing depths were found (Fig. 1h). 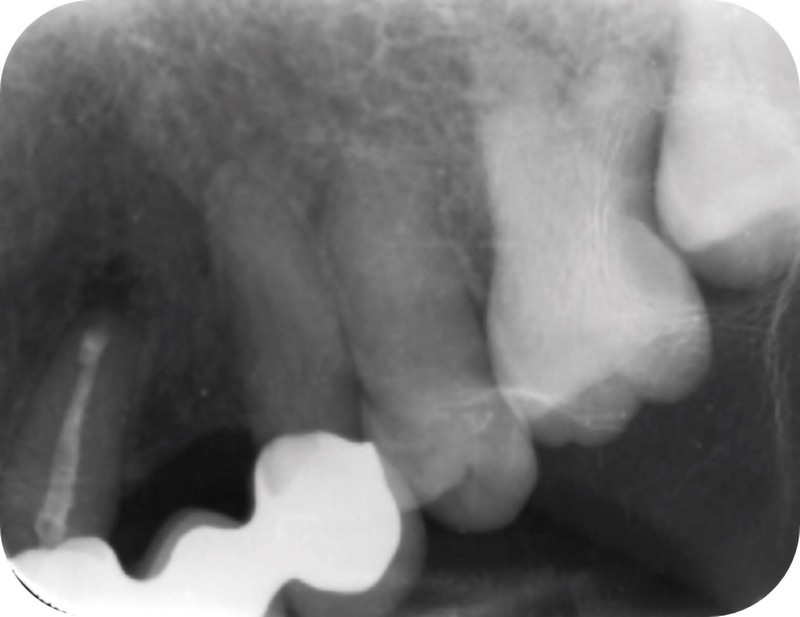 The periapical radiograph showed complete bone regeneration around the apex (Fig. 1i). 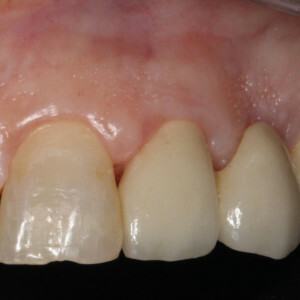 A 64-year-old female patient was referred to the oral surgery department of the University of Valencia with pain at the maxillary left lateral incisor, which had received a fixed ceramic restoration (Fig. 2a). 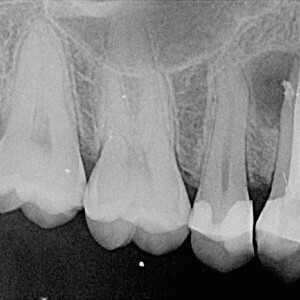 The periapical radiograph did not show any pathological condition around the apex; however, a small amount of endodontic cement extruding into the periapical region could be observed (Fig. 2b) and was confirmed with CBCT (Fig. 2c). Clinical examination discovered localized pain on palpation of the apical region of the lateral incisor. The patient was provided with full information about alternative treatments and their success rates. Finally, periapical surgery was performed. The surgery was carried out under local anesthesia with 4% articaine and 1:100,000 epinephrine (Inibsa). After elevation of a full-thickness mucoperiosteal flap, ostectomy was carried out using round 0.27 mm tungsten carbide burs (JOTA) mounted in a handpiece and abundant irrigation with sterile physiological serum. 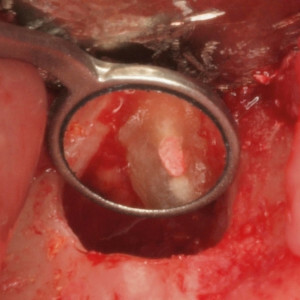 The minimum bone removal necessary to access the apex was performed, and the pathological soft tissue and endodontic cement extruding around the apex were thoroughly debrided (Fig. 2d). 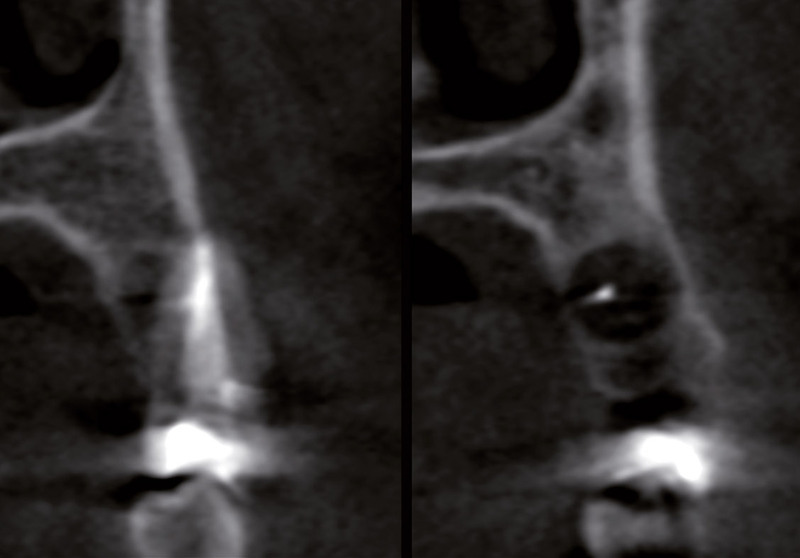 A retrograde cavity was prepared using ultrasonic retrotips (Piezomed) to a 3 mm depth (Fig. 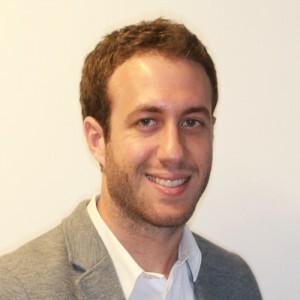 2e). Hemostasis of the bony crypt was performed using gauze with epinephrine (1 mg/mL; B. Braun). 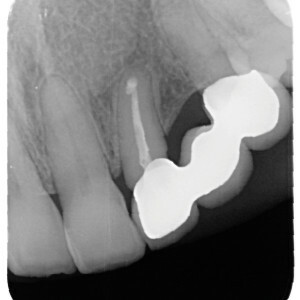 The root end cavity was filled with Biodentine (Fig. 2f). Tensionless soft-tissue flap closure was performed with a 6/0 thread (POLINYL, Sweden & Martina). 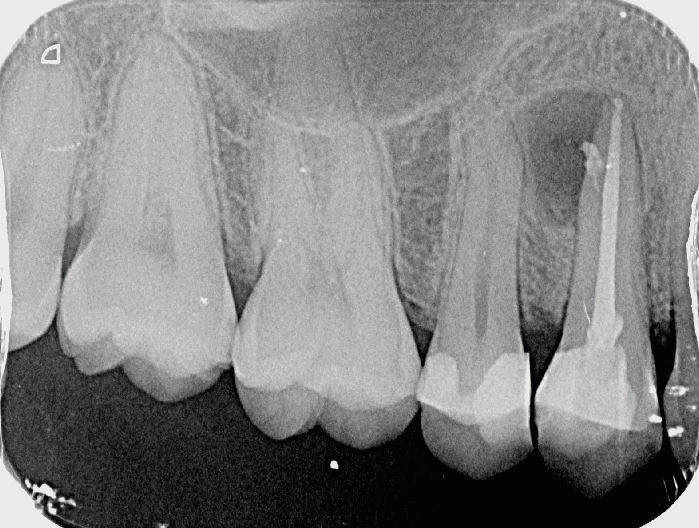 The intraoral radiograph showed adequate retrograde filling (Fig. 2g). The patient was prescribed amoxicillin (500 mg/8 h) preoperatively (2 days before surgery) and 5 days after the intervention, ibuprofen (400 mg/8 h) for 4 days, a 0.12% chlorhexidine rinse 3 times a day for 7 days, and paracetamol (500 mg) as needed in the event of intense pain. The sutures were removed after 1 week. At the follow-up visit after 1 year (Figs. 2h & i), the tooth was asymptomatic, no gingival recession had occurred and the minimal bone defect created with the ostectomy for apical access was completely regenerated. 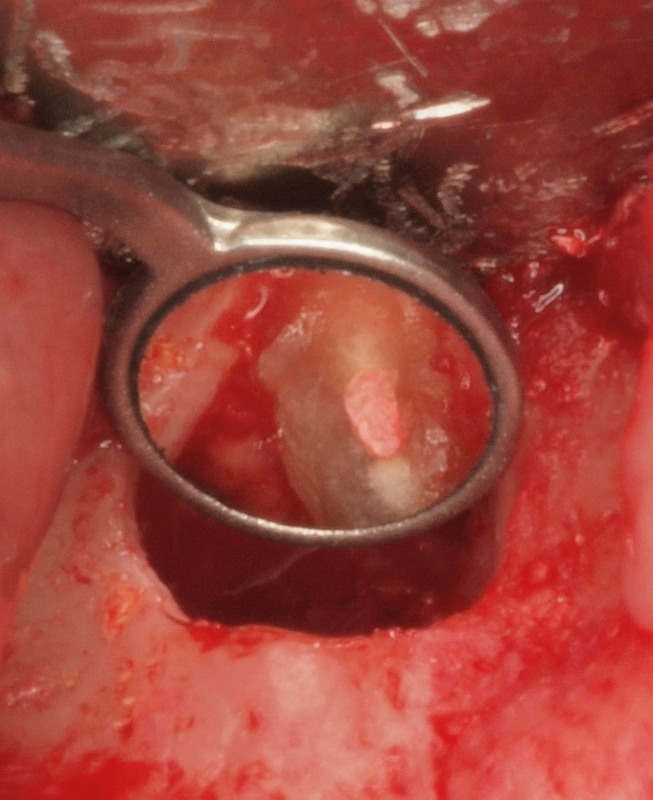 In recent years, MTA has been considered the gold standard material for periapical retrograde filling, since it has proved to be better than other materials studied.7Lindeboom JA, Frenken JW, Kroon FH, van den Akker HP. A comparative prospective randomized clinical study of MTA and IRM as root-end filling materials in single-rooted teeth in endodontic surgery. → Oral Surg Oral Med Oral Pathol Oral Radiol Endod. 2005 Oct;100(4):495–500.,8Christiansen R, Kirkevang LL, Hørsted-Bindslev P, Wenzel A. Randomized clinical trial of root-end resection followed by root-end filling with mineral trioxide aggregate or smoothing of the orthograde gutta-percha root filling—1-year follow-up. → Int Endod J. 2009 Feb;42(2):105–14.,9Chong BS, Pitt Ford TR, Hudson MB. A prospective clinical study of mineral trioxide aggregate and IRM when used as root-end filling materials in endodontic surgery. → Int Endod J. 2009 May;42(5):414–20. 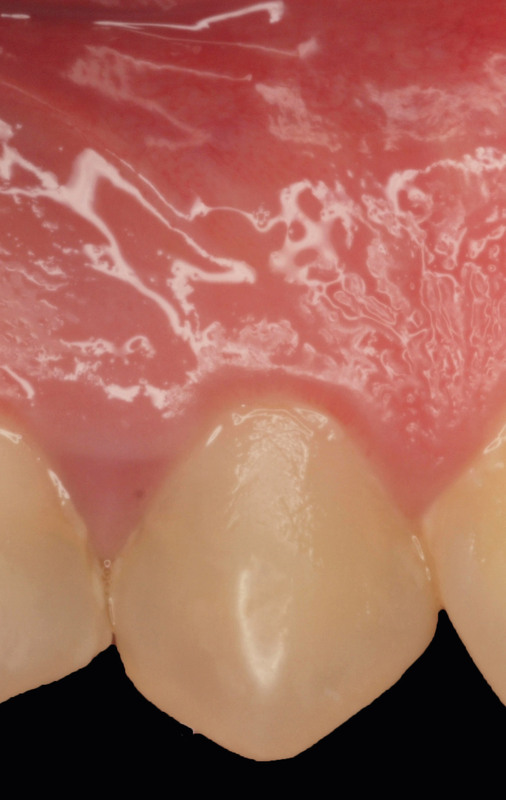 Recently, a new calcium silicate-based material, initially developed for restorative dentistry, began to be used as a retrograde filling material. In vitro studies have shown promising properties of tricalcium silicate cement. A comparative analysis between Biodentine, glass ionomer cement and MTA showed better marginal adaptation of Biodentine.10Ravichandra PV, Harikumar V, Deepthi K, Jayaprada RS, Ramkiran D, Krishna M JN, Malathi G. Comparative evaluation of marginal adaptation of BiodentineTM and other commonly used root end filling materials—an invitro study. → J Clin Diagn Res. 2014 Mar;8(3):243–5. From a biomechanical point of view, the sealing properties of Biodentine have been reported to be superior to those of MTA.11Han L, Okiji T. Uptake of calcium and silicon released from calcium silicate-based endodontic materials into root canal dentine. → Int Endod J. 2011 Dec;44(12):1081–7. This phenomenon is due to the absence of calcium aluminates and calcium sulfate in its formulation, which are known to decrease mechanical strength and extend setting time.12Caron G, Azérad J, Faure MO, Machtou P, Boucher Y. Use of a new retrograde filling material (Biodentine) for endodontic surgery: two case reports. → Int J Oral Sci. 2014 Dec;6(4):250–3. Biočanin et al. evaluated in an in vitro study the quality of retrograde filling (wettability, porosity and volume of the gap at the material–dentin interface) with Biodentine, MTA and glass ionomer.13Biočanin V, Antonijević Đ, Poštić S, Ilić D, Vuković Z, Milić M, Fan Y, Li Z, Brković B, Đurić M. Marginal gaps between 2 calcium silicate and glass ionomer cements and apical root dentin. → J Endod. 2018 May;44(5):816–21. The results showed that MTA and Biodentine possess certain advantages in comparison with glass ionomer with respect to wettability and porosity. Furthermore, Biodentine showed a tendency toward the lowest marginal gap at the cement–dentin interface. Clinically, the faster setting time, easier manipulation and low cost seem at this time greater advantages of Biodentine compared with MTA.14Ravichandra PV, Harikumar V, Deepthi K, Jayaprada RS, Ramkiran D, Krishna M JN, Malathi G. Comparative evaluation of marginal adaptation of BiodentineTM and other commonly used root end filling materials—an invitro study. → J Clin Diagn Res. 2014 Mar;8(3):243–5.,15Biočanin V, Antonijević Đ, Poštić S, Ilić D, Vuković Z, Milić M, Fan Y, Li Z, Brković B, Đurić M. Marginal gaps between 2 calcium silicate and glass ionomer cements and apical root dentin. → J Endod. 2018 May;44(5):816–21. 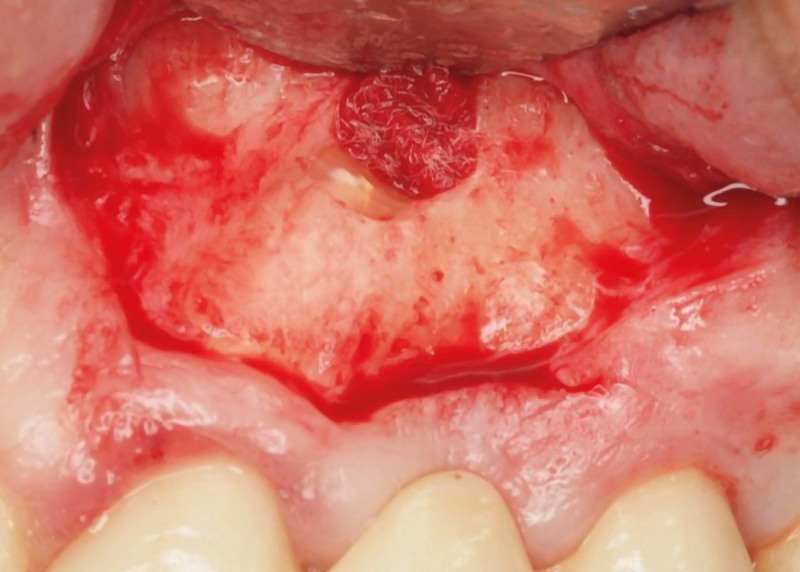 The success of periapical surgery achieved in both cases and the adequate management of tricalcium silicate cement as a retrograde filling material are highly promising. The absence of studies with large and long-term series make the prognosis of apical surgery with this new material unknown. 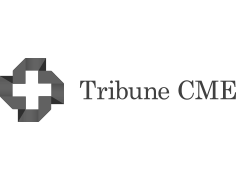 More clinical studies are necessary to establish whether tricalcium silicate cement is an alternative to MTA in periapical surgery. Fig. 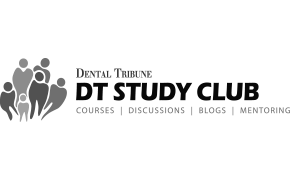 1a – Clinical examination of the maxillary right first premolar. Fig. 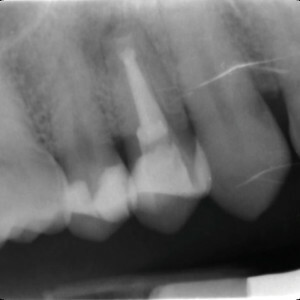 1b – The periapical radiograph showed a lesion around the tooth apex. Fig. 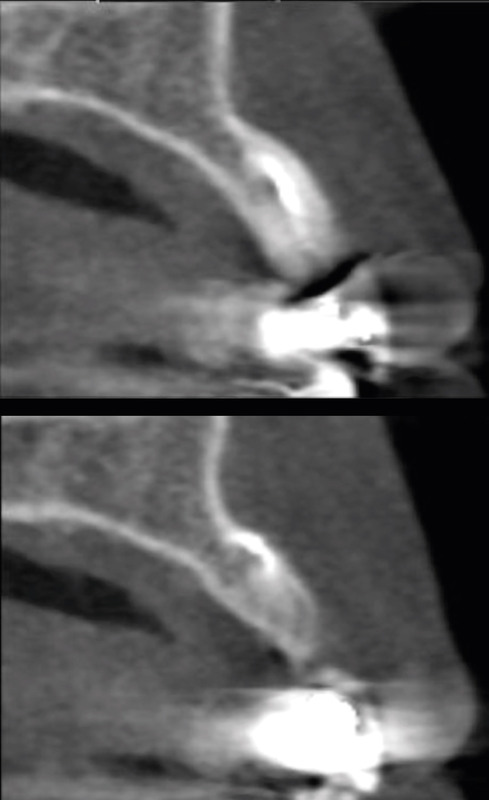 1c – CBCT confirmed the diagnosis. Fig. 1d – Intraoperative photograph after apicoectomy. Fig. 1e – Apical retrograde micromirror view of apicoectomy. Fig. 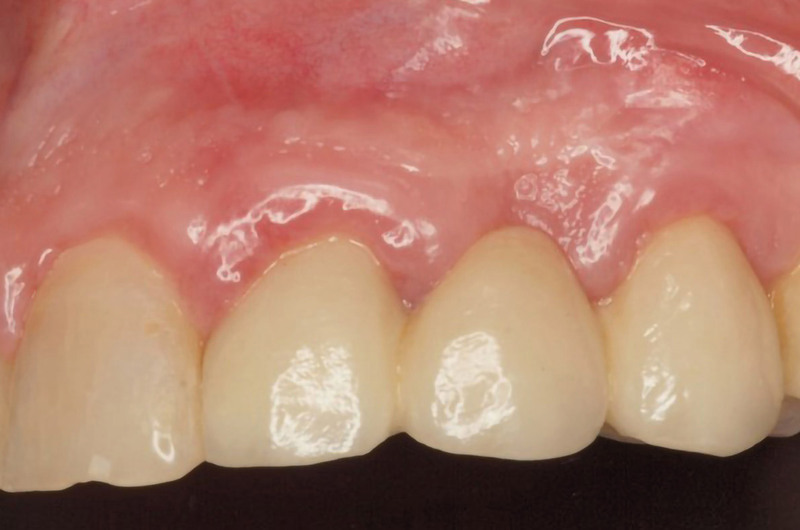 1f – Root-end filling was performed with tricalcium silicate cement. Fig. 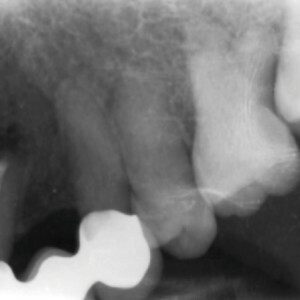 1g – Postoperative periapical radiograph. Fig. 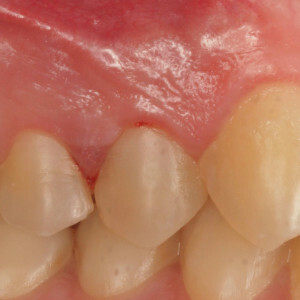 1h – Clinical photograph at 1-year follow-up. Fig. 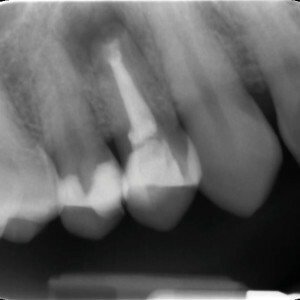 1i – The periapical radiograph after 1-year follow-up showed complete bone healing. Fig. 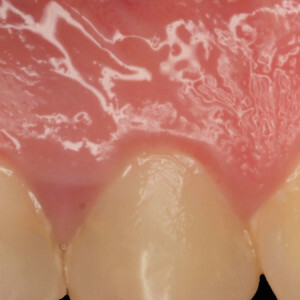 2a – Clinical examination of the maxillary left lateral incisor. Fig. 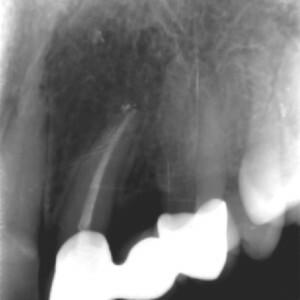 2b – The periapical radiograph showed endodontic cement extrusion. Fig. 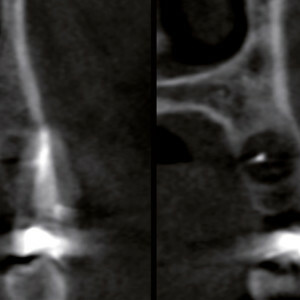 2c – CBCT confirmed the diagnosis. Fig. 2d – Intraoperative photograph after apical resection. Fig. 2e – Apical retrograde micromirror view of apicoectomy. Fig. 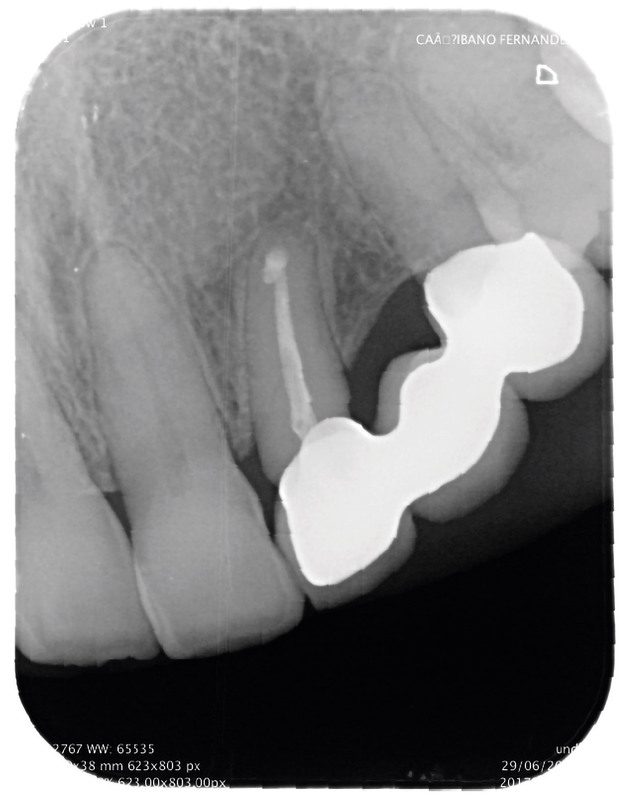 2f – Root-end filling was performed with tricalcium silicate cement. Fig. 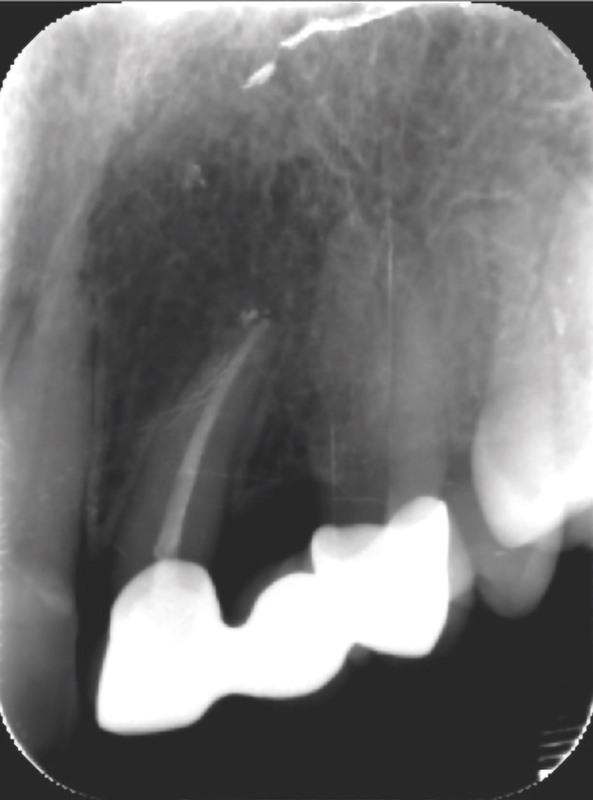 2g – Postoperative periapical radiograph. Fig. 2h – The clinical photograph after 1-year follow-up showed adequate soft-tissue healing. Fig. 2i – The periapical radiograph after 1-year follow-up showed complete bone regeneration. 1. ↑ Setzer FC, Kohli MR, Shah SB, Karabucak B, Kim S. Outcome of endodontic surgery: a meta-analysis of the literature—Part 2: comparison of endodontic microsurgical techniques with and without the use of higher magnification. → J Endod. 2012 Jan;38(1):1–10. 2. ↑ Tsesis I, Rosen E, Taschieri S, Telishevsky Strauss Y, Ceresoli V, Del Fabbro M. Outcomes of surgical endodontic treatment performed by a modern technique: an updated meta-analysis of the literature. → J Endod. 2013 Mar;39(3):332–9. 3. ↑ Von Arx T, Peñarrocha M, Jensen S. Prognostic factors in apical surgery with root-end filling: a metaanalysis. → J Endod. 2010 Jun;36(6):957–73. 4. ↑ Laurent P, Camps J, De Méo M, Déjou J, About I. Induction of specific cell responses to a Ca3SiO5-based posterior restorative material. → Dent Mater. 2008 Nov;24(11):1486–94. 5, 12. 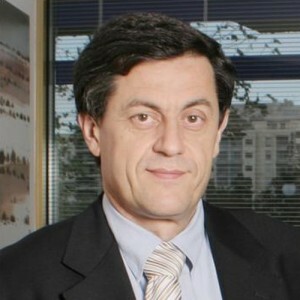 ↑ Caron G, Azérad J, Faure MO, Machtou P, Boucher Y. 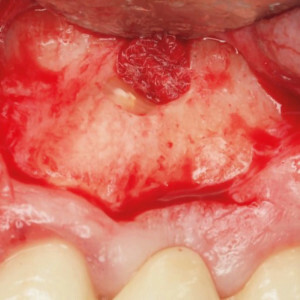 Use of a new retrograde filling material (Biodentine) for endodontic surgery: two case reports. → Int J Oral Sci. 2014 Dec;6(4):250–3. 6. 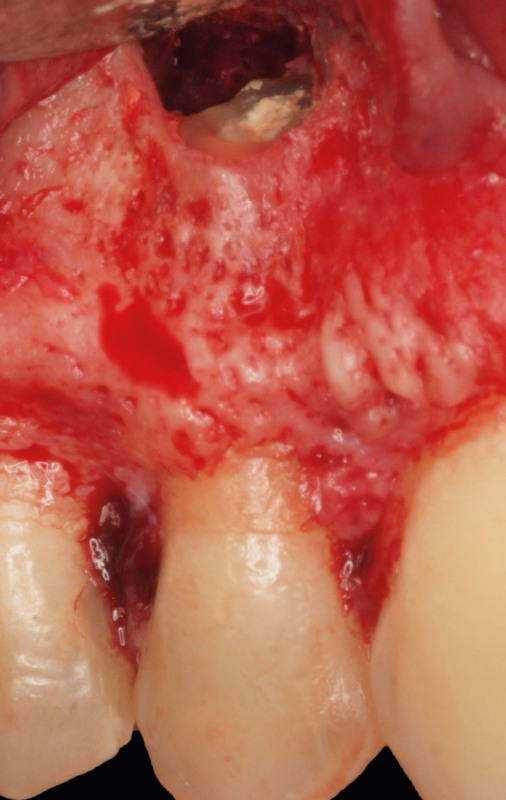 ↑ Bachoo IK, Seymour D, Brunton P. Clinical case reports using a novel calcium-based cement. → Br Dent J. 2013 Jan;214(2):61–4. 7. ↑ Lindeboom JA, Frenken JW, Kroon FH, van den Akker HP. A comparative prospective randomized clinical study of MTA and IRM as root-end filling materials in single-rooted teeth in endodontic surgery. → Oral Surg Oral Med Oral Pathol Oral Radiol Endod. 2005 Oct;100(4):495–500. 8. ↑ Christiansen R, Kirkevang LL, Hørsted-Bindslev P, Wenzel A. Randomized clinical trial of root-end resection followed by root-end filling with mineral trioxide aggregate or smoothing of the orthograde gutta-percha root filling—1-year follow-up. → Int Endod J. 2009 Feb;42(2):105–14. 9. ↑ Chong BS, Pitt Ford TR, Hudson MB. A prospective clinical study of mineral trioxide aggregate and IRM when used as root-end filling materials in endodontic surgery. → Int Endod J. 2009 May;42(5):414–20. 10, 14. ↑ Ravichandra PV, Harikumar V, Deepthi K, Jayaprada RS, Ramkiran D, Krishna M JN, Malathi G. Comparative evaluation of marginal adaptation of BiodentineTM and other commonly used root end filling materials—an invitro study. → J Clin Diagn Res. 2014 Mar;8(3):243–5. 11. ↑ Han L, Okiji T. Uptake of calcium and silicon released from calcium silicate-based endodontic materials into root canal dentine. → Int Endod J. 2011 Dec;44(12):1081–7. 13, 15. 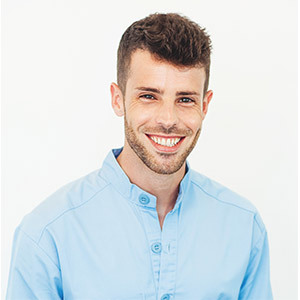 ↑ Biočanin V, Antonijević Đ, Poštić S, Ilić D, Vuković Z, Milić M, Fan Y, Li Z, Brković B, Đurić M. Marginal gaps between 2 calcium silicate and glass ionomer cements and apical root dentin. → J Endod. 2018 May;44(5):816–21.